Download a sample copy of the Everything DiSC Workplace Profile. Watch a brief informative video about this product as you review the profile. 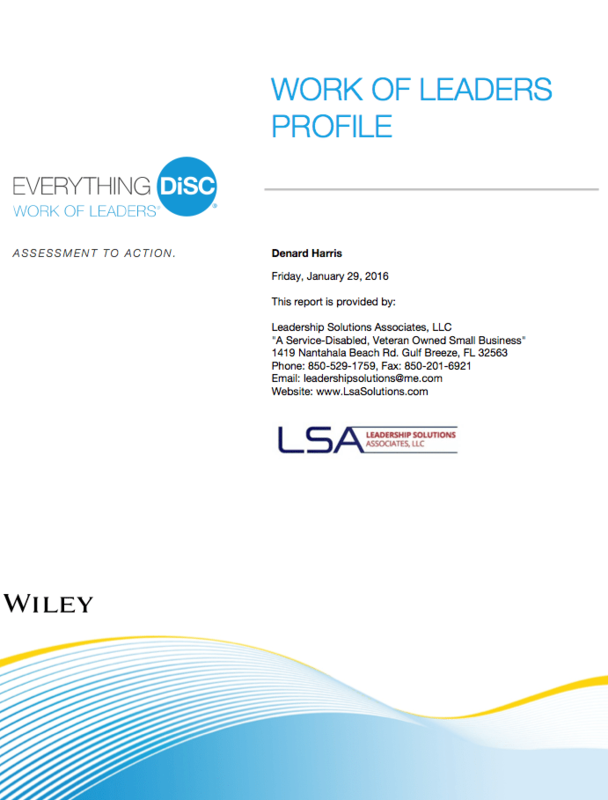 This functional assessment tool is built for today’s workplace and is the most commonly applied entry-level DiSC assessment. Everything DiSC Workplace (ED_W) focuses on workplace behaviors, tendencies, and preferences. ED_W assists with developing, among other things, conflict resolution, teambuilding, and problem solving skills. It begins with self-discovery and progresses easily to encourage understanding your priorities in the workplace as well as those of your peers, supervisors, and managers. 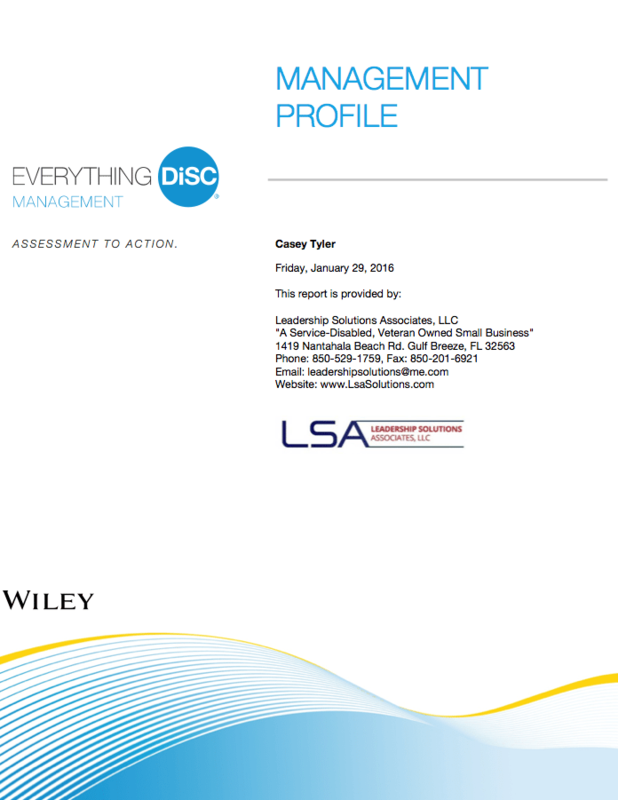 Don’t forget to download the Everything DiSC Comparison Sample Report below to take advantage of a special feature of Everything DiSC through LSA. 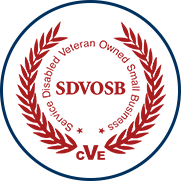 View the EverythingDisc.com video for additional productive no cost functionalities. Everything DiSC for Managers (ED_W) focuses on one of the most difficult aspect of management sometimes, dealing one-on-one with employees and even your supervisor. It helps you keep in check your priorities with those of the organization so you can be more efficient when directing and delegating work to your personnel. ED_W can also assist you to more effectively motivate and develop your personnel as well as communicate better with your supervisor to meet their needs and requirements. Everything DiSC Work of Leaders (ED_WOL) is the most beneficial leadership training you can get in a one-day workshop. The “Work of Leaders” emphasizes that leading can be placed in the context of having three-steps: 1) Having a vision for a group of people and, 2) Aligning the efforts of people and other resources to effect successful, 3) Execution of that vision/requirement, etc. (Vision, Alignment, Execution = VAE). 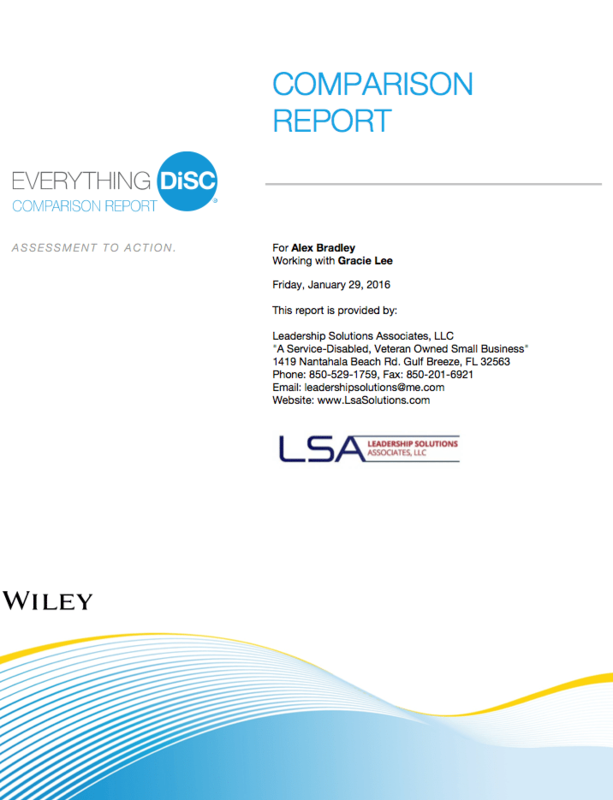 The Everything DiSC Comparison Report keeps DiSC relevant long after the workshop is over…at no additional cost. 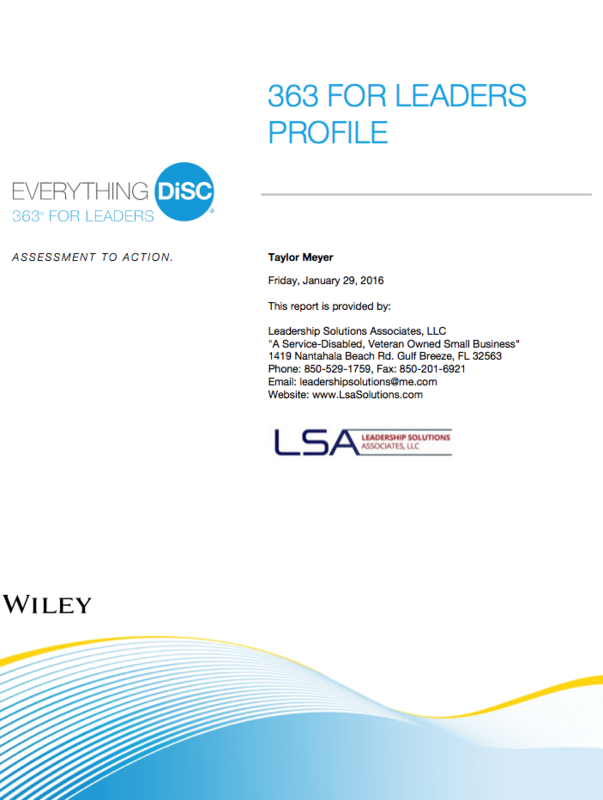 Everything DiSC 363 (ED_363) is a three hundred and sixty degree feedback assessment. Participants are provided an opportunity to elevate their leadership effectiveness by, 1) understanding how others see you as a leader, 2) explore your tendencies on eight leadership approaches and, 3) learn strategies to become a more effective leader within your workplace. A more detailed video of the focus assessment areas of an Everything DiSC 363 may be viewed for a greater understanding of this professional assessment tool. 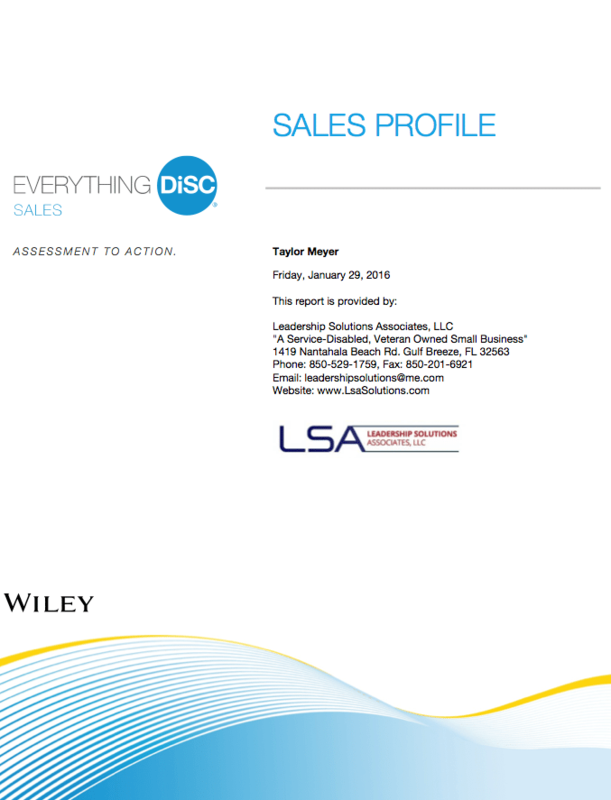 Everything DiSC Sales (ED_S) is a stand-alone sales methodology or another refresher tool for your sales toolbox. After first understanding your sales strengths and priorities this training also helps you to “tune in” the customer and recognize buying style as well as what is driving their buying decisions. Finally, how can you and the buyer(s) work together to close the sale and build a productive and profitable future relationships for repeat sales or referrals. Watch the Orientation Video that your Team Members review before attending the workshop as you review the profile. The Five Behaviors of a Cohesive Team (5BCT) is the gold standard for teamwork training. As certified facilitators of the 5BCT Workshop at LSA we are fascinated by what aligned and cohesive teams can achieve and we can help yours obtain a firmer understanding what drives and contributes to true teamwork. 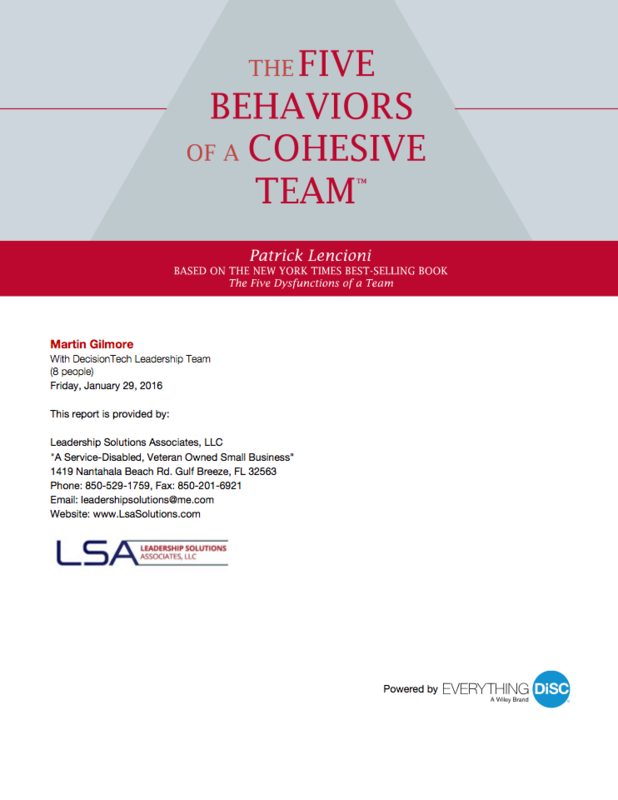 A more detailed video of the entire Five Behaviors of a Cohesive Team Workshop may be viewed here.